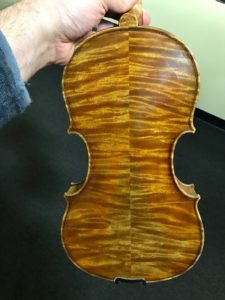 I just returned from a trip to one of our sources for instruments and hand-selected an entire van full of violins, violas, cellos, and basses. It has been exciting to get them arranged here at the store, ready for you to try them! 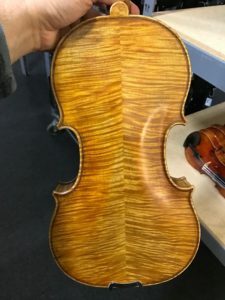 Interested in looking at violins between $850 and $2,000? We have about SIXTY of them for you to try! Many different workshops are represented and all of them are lovingly set up for maximum playability. On another note, this warmer weather has been a wonderful break from winter, but the cellos and basses in the shop are about as confused as the birds chirping in my yard! If your instrument sounds or feels like it needs an adjustment, bring it in as well. Good luck to everyone involved in ISSMA state competition this weekend! I read an article about Sarah Dupuis of Chicago, who volunteers her time teaching underprivileged children in that city, and was wondering if you know of any such organization here. I believe people donate violins to her for her students because their parents cannot afford to buy an instrument for them. Josie, thank you for your comment! You might reach out to the Metropolitan Youth Orchestra if you are interested in donating an instrument. They do fantastic work here in Indianapolis!